For over a decade I attened meeting in meeting rooms containing coffee and a telephone. Those meetings could often be defined by the word 'unproductive'. I would leave them tired, stressed, and often wondering why I went in the first place. That doesn't happen a lot anymore. 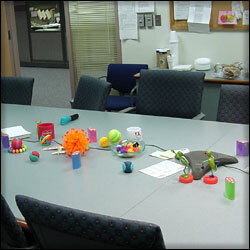 A lot of people will tell you that toys in a meeting room are a distraction. This may be true, but as many of us know, it doesn't take a toy to distract you. You can daydream, worry about your finances, think about that project you were working on earlier, or otherwise occupy your mind easily enough. You don't need a toy to do that. A toy is a useful distration. It allows you to occupy those parts of your mind that are growing restless, without actually distracting you from what's being discussed. A simple puzzle or some glitter putty can keep the spatial portion of your brain content while letting the rest of your brain focus on what's important. More importantly, it gets people into the habit of thinking at meetings, something many of us wish more people would do. Toys don't have to be expensive. 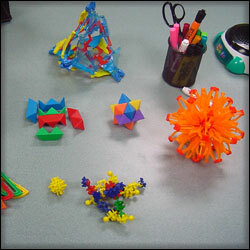 Rubik's Cubes and Glitter Putty can be found almost anywhere at very little cost. Aaron's Thinking Putty costs a little more, but some plastic containers and a bulk purchase are well worth the money. Hoberman Expandagons and Geo Mags get a little more expensive, but they last longer and tend to be extremely popular. Puzzle of all shapes and styles can be found almost anywhere, and they always seem to find a victim or two. The important thing is to keep your eye open for possibilites. Children learn a lot faster than adults. Personally I suspect that it's the joy of discovery and their constant play that helps them accomplish that. And with a little thought, you can incorporate that little jolt of brain energy into everyday things. Near the entrance of our office is a game of group chess. Take a look at the board, make a move, and flip the sign over. What's funny is that the game almost seems to be a metaphor for programming. Often an obvious solution is found by someone, only to be completely missed by whomever follows them, and the game degenerates. Equally often, someone thinks they've found the right solution, only to realize that the other side is not playing in a predictable fashion. 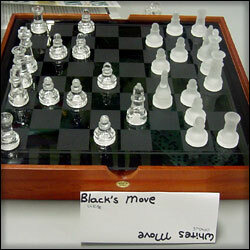 Simple solid moves that everyone can understand seem to be the right solution, but such moves are hard to find.